Who: The shadows in the shadow realm. What: Are overjoyed to see one another again. Where: On the streets in New York. Why: Because they only see one another once a day at the same location. 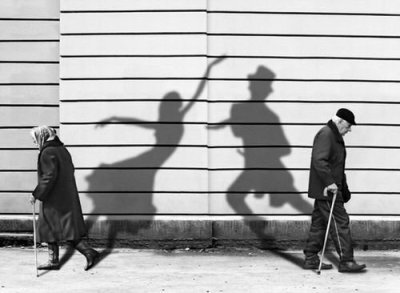 How did it go: They danced until they couldn't see each other anymore. There had been so many cold, dismal, gray days lately she hadn't been allowed to come outside. She hadn't been able to see anything, let alone him, in what felt like years. But now the sun was out, and slowly setting behind the large buildings, with plenty of light to allow her to roam freely. She watched the corner intently, waiting for him to come around it. The man he was attached to walked slowly, but she appreciated his slowness just as much as she appreciated the woman's she was attached to. Once upon a time, when the woman had been a young girl, she had loved the girl's fast pace, and as the girl grew older, began to resent the slow speed in which she strode. But now her patient, steady amble presented more than enough time for her to wave an excited greeting to him. He waved merrily in response, as ecstatic to see her as she was to see him. She curtsied to him, elegant and graceful. He bowed deeply in response, and as the two humans drew closer they drew closer as well. She straightened, holding her arms up tall to fall into his arms. He caught her as she knew he would, and for a brief moment they embraced, holding one another, and she lost herself in the moment, blissful at the sensation of being enveloped in the darkness that matched her own. The woman's slow gait began to take her away, and it was with great reluctance she released him, curtsying deeply. He bowed again in response, and as the woman turned the corner of the old stone building she was pulled from his sight--the worst part of her day. But tomorrow, she reminded herself. Tomorrow might be another day with sunlight. And tomorrow she might see him again.